Jihad Watch : This spells more trouble for the EU, given the announcement earlier this week that the Czech Republic was considering a “Czexit” (or “Czech-out”) referendum to leave the EU. Austria and the Visegrad group have been dedicated to public safety in the face of jihad attacks, mass rapes, no-go zones and escalating crimes that have been sweeping Europe since the influx of Muslim migrants. The Islamic State also made good on its promise to infiltrate the “refugee” stream. 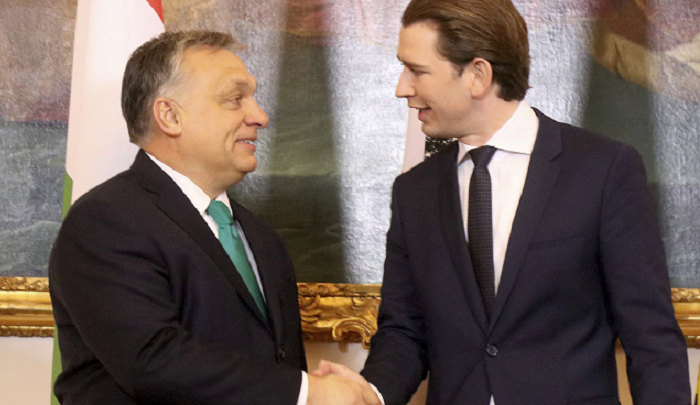 “Kurz said he agreed with the Visegrad countries – Czech Republic, Hungary, Poland and Slovakia – that a quota system for migrants was unworkable and on the need to strengthen external borders.” The Visegrad group has resolutely stood against the meddling of the EU, as the latter imposes its suicidal immigration policies, along with threats of sanctions. In mid-January, the Austrian government called for “restrictive asylum policy” due to escalating crime. Crimes committed by “foreigners” in Austria were 40 percent of the total in 2016, with most offenders being primarily Muslim Afghans, Chechens and North Africans. Despite all this, right before Christmas, the European Commission began Article 7 proceedings against Poland (aka the nuclear option) to suspend Poland of its voting rights in EU institutions. Hungarian leader Viktor Orban vowed to stand strong with Poland and not support such a move. Orban and Kurz have also pledged their support to each other. Let’s hope that more European nations come to their senses as with Austria and the Visegrad group; otherwise, the EU faces imminent collapse due to its own recklessness and lack of appreciation for its own history, culture, and institutions.